Sally Clarkson points to Jesus’ life and particularly his last night with his disciples as our example in discipling our children and others who enter our home. The atmosphere we provide in our home, the food and drink we prepare, and the words of friendship and encouragement we share all work together to draw us closer together and closer to Christ. Here’s the publisher’s description for A Lifegiving Home. Make your table a place where your family and friends long to be―where they will find rest, renewal, and a welcome full of love. Beloved author Sally Clarkson believes that meals lovingly served at home―and the time spent gathered together around the table―are a much-needed way to connect more deeply with our families and open our kids’ hearts. Food and faith, mingled in everyday life, become the combination for passing on God’s love to each person who breaks bread with us. I loved the section on sustainablity. Sally Clarkson points out that just “getting by” is not sustainable. We need to take time to nourish our souls as well as our bodies. So in an effort to do that, I decided that I should put more effort into our mealtimes. I pulled out a wrinkled tablecloth and cut some flowers from the front yard. My two-year-old little girl watched me as I spread the tablecloth on the table and exclaimed, “What are you doing, Mommy? Are we going to eat on the covers?” And then again as I put the flowers on the table, “Flowers are yucky.” For a minute I was offended. I knew that the hydrangeas were past there prime, but I still thought they were beautiful. Then she added, “I don’t want to eat flowers,” and I understood it wasn’t their appearance she was protesting. But soon, being the lady-like little girl she is, she insisted on having a “cover” on her highchair, too. Clearly, we need to do flowers and a tablecloth more often. Not all of us will follow the Clarkson’s example of table cloths and candles and homemade bread, but we can all be inspired with a greater vision and commitment to intentionally disciple the children God has given to us. I believe that Sally Clarkson’s book The Lifegiving Table will do just that. And who wouldn’t love a book that encourages you to drink more tea. 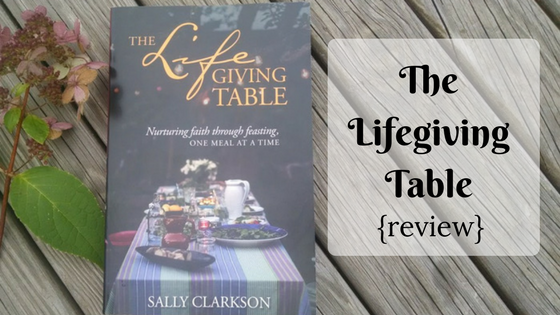 As part of Tyndale’s Blogger Review program, I received a free copy of The Lifegiving Table in exchange for an honest review. Which is Better for Sellers- Teachers Pay Teachers or Educents? This sounds like a book I should get! I feel like so often I’m in a rut, just doing the cooking we need to get by. I do that a lot, too! Sometimes I think cooking is such a waste of time. 🙂 That’s why I love the new perspective this book gives me (and other of Sally Clarkson’s writings).